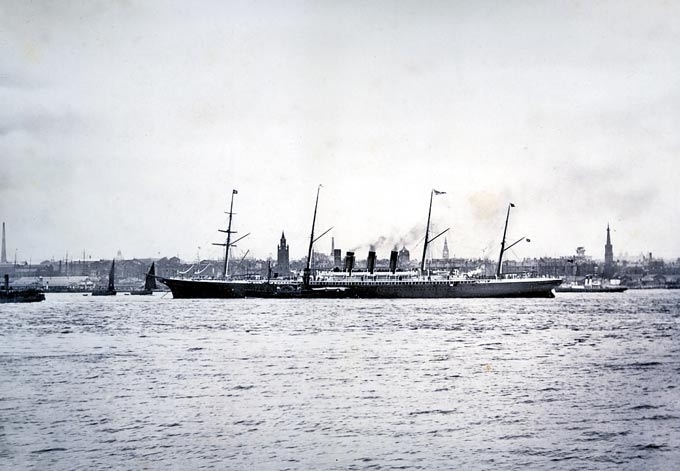 SS Mauritania entering Liverpool Docks. 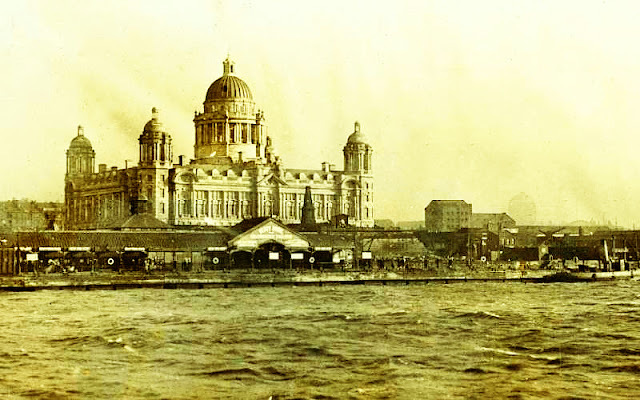 Liverpool became Britain’s number one port for passengers wishing to travel to America during the latter half of the 19th century; the city was called ‘The Gateway to the West’. The shipping and commerce of the Mersey were exceeded only by those of the Thames with its Port of London and also Tilbury. Because of the River Mersey’s very high tides, often as much as 32 feet, the docks had to be enclosed by a wall some 10 feet thick and reaching 12 feet above the maximum high-water mark. 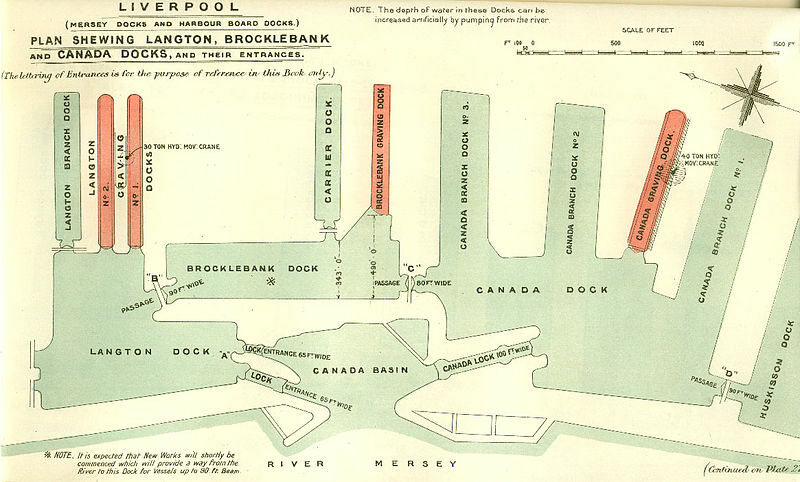 Access to the docks was by three main entrances located at Canada, Sandon and Brunswick docks and connected to the river by half-tide basins. However, having to use these sea locks caused delays to liners, which frequently spent hours at anchor in the river waiting for the tide in order to enter dock and, when tides were exceptionally low, even to reach the Landing Stage to discharge their passengers. Five famous companies competed for the passenger and mail traffic to North America: The Allan and Dominion Line Royal Mail Steamers, involved in the transatlantic immigrant passenger service between Liverpool, Queenstown (Cobh) and Boston; Liverpool to Quebec and Montreal and Naples to Boston. They were in operation under Dominion Line from the late 1800s to 1908. Cunard, White Star and the American owned Inman and International running to the United States. 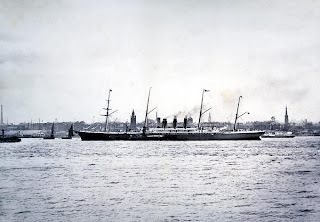 The Americans in particular were not happy with the delays at Liverpool and the docks at Southampton offered many advantages as care had been taken to ensure that the new Ocean docks on the Solent were open basins whose quays could he reached by the largest liners at all states of the tide, and where they were able to turn-round ships between voyages without excessive delays. 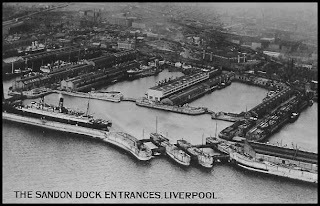 Liverpool’s docks were owned and managed by the Mersey Docks and Harbour Board, and the possible loss of the American liners concerned the Board members so much that they began to consider counter measures. One proposal was to utilize a large area of land at the north end of the system and construct an estate that would provide direct access from the river at all states of the tide for even the largest ships. But some members of the Board, who were mainly concerned with cargo traffic, including the Chairman, Alfred Holt, considered that the money could be better spent on improving existing docks facilities. It was finally decided, as a compromise to deepen the bed of the river at the Landing Stage and to widen the entrance at Sandon Dock from 80 feet to 100 feet. These proved to be wise decisions as they would enable the new large vessels already planned by Cunard to reach the company’s berths at Huskisson Dock and the Board’s largest graving dock at Canada Dock. However, these improvements would do little to cut the waiting time caused by the Mersey tides. In 1902 the White Star Line joined the powerful International Mercantile Marine, which was financed by American capital, and decided to build two of the world’s largest liners. To conform to American practice they would terminate their Number one passenger and mail service from New York at Southampton. Once again the Mersey Docks and Harbour Board could see the potential movement of passenger shipping, away from Liverpool, and the new dock proposal was re-examined. This time it was suggested that a three branch estate should be constructed, including a dry dock that could accommodate ships up to 1,000 feet in length. Parliamentary powers were approved in 1906, but the idea was shelved when it was estimated that the cost of the work would he over £2 million. Cunard Line began to build its new super-liners in 1905; they were expected to be not only the fastest in the world, but also the largest, with a length of 790 feet and a beam of 88 feet. 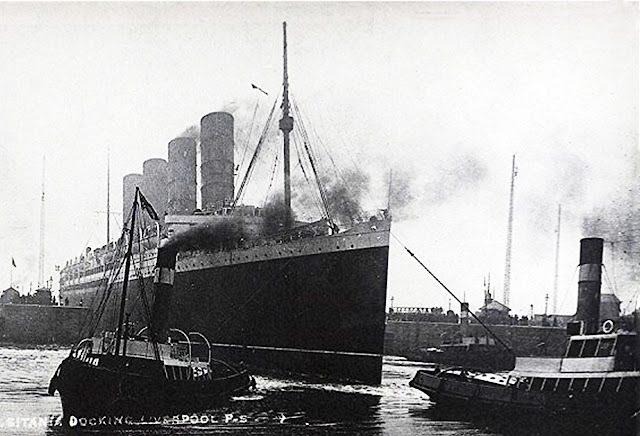 Losing these ships to Southampton would have had a devastating effect on Liverpool, however, Cunard eventually declared its intention to continue to use the Port of Liverpool as its terminal port, as it was expected that the ships would spend only five days in port before sailing again. 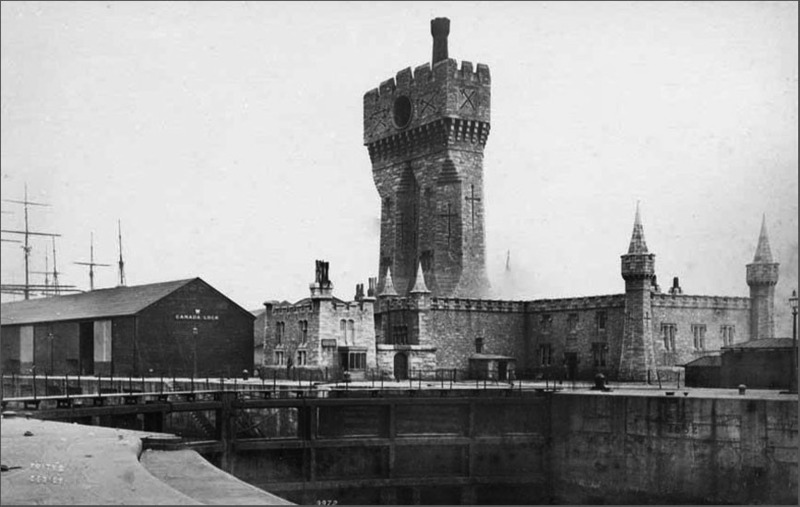 The hydraulic tower that long stood in Canada Dock. It was tragically destroyed in an air raid in 1941. Cunard had no wish to arrange for the new ships to enter dock unless it was absolutely necessary. Instead it asked that a large buoy be moored in the river off Woodside, at which the liners could complete the turn-round. This was provided, and additional measures included the removal of a further large quantity of rock and silt from the bed of the river at the Landing Stage. At the same time passenger facilities at the landing stage were further improved by the fitting of an upper deck. 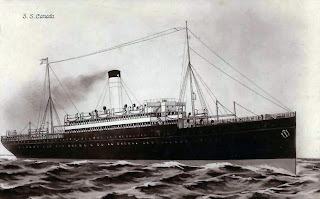 Two superliners, named Lusitania and Mauretania, duly entered service and, although capable of their designed speed of 25 knots, it was usually found necessary to use a third ship in order to maintain a weekly transatlantic service. 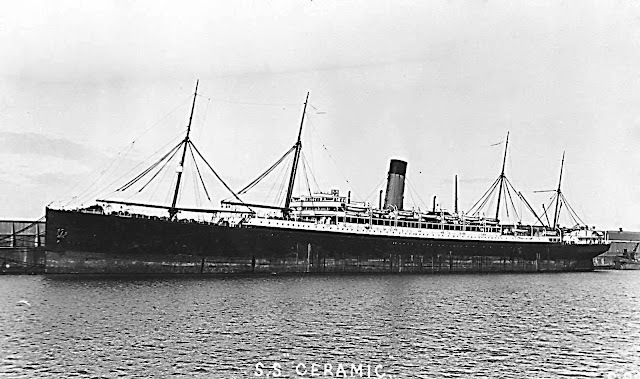 Either the much older Campania or the Lucania was used until a third super-liner could enter service. 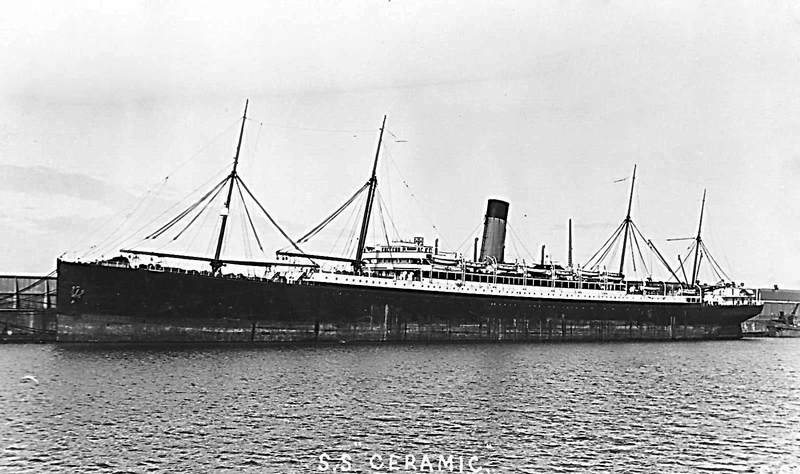 Cunard duly announced in 1910 that it was ordering a third vessel to match the luxury of the first pair, the new Aquitania, a considerably larger vessel designed to compete with the Atlantic liners. With a tonnage of 45,500 with a length of 901 feet and a beam of 97 feet, the thousand-foot liner had almost arrived. Cunard was not prepared to service so large a ship at the river buoy, and stated that Liverpool must provide a suitable dock or the ship would sail to and from Southampton. 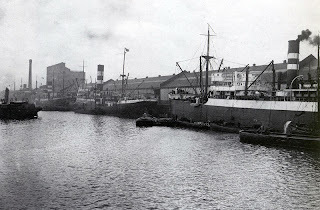 The Dock Board decided on a modern dock estate should be built as there would c not be sufficient time to complete a three branch project before the new ship came into service. The new dock was eventually built about nine months ahead of schedule. The first stage, which was completed by April 1913, was the construction of a single basin 1,050 feet in length. Its 120-foot wide entrance was connected by a direct channel to the Mersey and was consequently capable of being used at all stages of the tide. The basin would have dual functions: when flooded, cargo could be handled using the latest quayside equipment and transport facilities, and when ‘dried out’ it would become the largest graving dock in the world. King George V and Queen Mary duly opened the graving dock on 11 July 1913 and the occasion included one of the finest parades of shipping ever seen on the Mersey, which included ‘The Ceramic’ which was launched on 11th December 1912, she was making her first public appearance at the Merseyside Pageant . Ships where, decked out in bunting and banners, and ‘The Ceramic’ joined a ten mile line of shipping to welcome King George V and Queen Mary. The exuberance, with which this Royal Visit is reported in the press, must reflect not only the delight the King experienced to be presented with such a sight, as a former Mariner himself, but also the joy that it brought to the area of Merseyside that would become the Ceramic’s adopted home. She later became nicknamed “The Relief of Bootle”, or “The Breadbasket of Bootle”, because she employed so many of the town’s seafarers, keeping them from the dole queue in the precarious inter-war period. 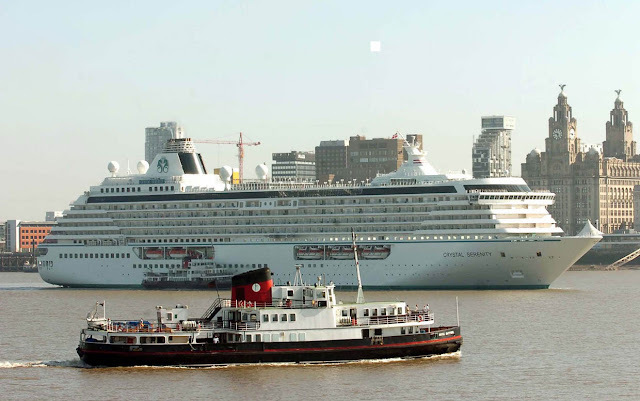 Despite the austerity of the 80s and 90s, due largely to containerisation and the movement of goods by road and rail, which saw a massive decline in shipping in Liverpool, and despite the closure of large parts of the dock system, the cruise liners are with us once again. Cruise ships had been operating from the port with a terminal at Langton Dock. But, Cruise ships returned to Liverpool's Pier Head in 2008, berthing at a newly constructed cruise terminal. Since 2012, the terminal has been used as the start and end of voyages, and not just as a stop-off point. Ships which have called at Liverpool include RMS Queen Elizabeth 2 (QE2), Grand Princess and RMS Queen Mary 2, along with a number of large Royal Navy vessels. Liverpool is one of the few cities in the world where ocean-going cruise ships can berth in the city centre, providing a spectacular addition to the waterfront skyline. The Liverpool Cruise Terminal is set for its busiest year so far as it prepares to welcome 54 cruise ships in 2015, bringing with them an expected 80,000 international visitors to the city. Many of the new vessels and cruise lines will be making their inaugural calls along the Mersey to the historic port. The highlight of the season will be two events to celebrate Cunard Cruise Line’s 175th anniversary. The first, on May 25, will see the Cunard fleet arrive on the Mersey, creating an unprecedented Three Queens spectacle in Liverpool that will make maritime history. On the 4th of July, the Cunard flagship Queen Mary 2 will return to Liverpool to celebrate Britannia’s transatlantic departure exactly 175 years earlier. Added to this there will be events across the city celebrating cruise travel and how an industry that was born in Liverpool changed the world culturally.